What is the CREATE Center? The Collaborative Research & Entrepreneurial Activities, Training & Education Center (CREATE) was established in 2016 in the Office of Research and Economic Development to develop a comprehensive and cohesive innovation ecosystem across all colleges, schools and programs at USA. CREATE is led by Dr. Michael Chambers, Assistant Vice President for Research Innovation. Dr. Chambers serves as PI for a National Science Foundation Innovation Corps (I-Corps) Site at USA. 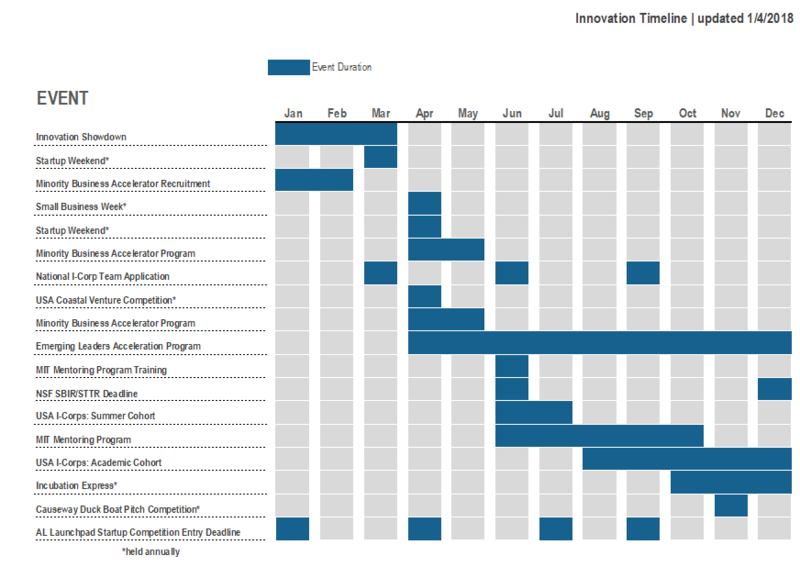 The Innovation Scholars program will take teams through an I-Corps-approved curriculum for learning best practices in customer discovery for science-based innovations. Partnering institutions include Bishop State Community College, Spring Hill College, and the University of Mobile. CREATE will unify all aspects of the USA innovation ecosystem into a comprehensive and cohesive framework that not only serves USA, but also engages and organizes the greater entrepreneurship community. USA has been a catalyst for collaboration and creation of the innovation ecosystem in Mobile. This process began with USA taking the lead in the effort to be designated as a Manufacturing Community. It has continued with USA’s external collaborations with the Chamber of Commerce, the Innovation Portal, Exchange 202, Startup Weekend, the Young Entrepreneurs Academy, the Airbus Innovation Showdown, the City of Mobile, Mobile County, the Minority Business Accelerator, and the MIT Mentoring Program. USA is highly focused on identifying technologies that can be commercialized. Consistently ranked in the top 20 of royalty revenue, USA has achieved extraordinary success in the past despite its size and relative youth. Enlarge our Innovation Timeline by clicking the thumbnail below.